And we remember Rauschenbusch by picking up a copy of Christianity and the Social Crisis in the 21st Century edited by Paul Rauschenbush, Associate Dean of Religious Life and the Chapel at Princeton University and great-grandson of the father of the Social Gospel Movement. Rick Wilson, chair of the Christianity Department at Mercer University, has written a review of Christianity and the Social Crisis in the 21st Century for the latest Baptist Studies Bulletin. 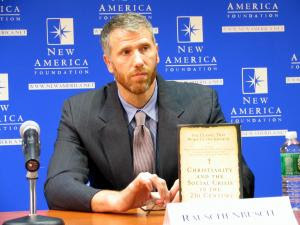 You can watch a discussion of the book at The New America Foundation below.